It has been awhile. Work is keeping me busy and wearing me out. I come home and crash, usually, so I don't have a lot of time for blog posts or anything really. Less that 2 weeks left before summer is here though, and you can expect to see me tons once that gets here! It has been an interesting couple of weeks. I was kind of having a bad run for awhile, but this last week made up for it all. Although, I have the flu today, unfortunately. Boo! I was bragging that I was one of the very few people to not get it at work- staff and students alike. But yesterday it hit me like a ton of bricks and here I sit hoping it goes away soon. But you know what? I don't care. You know why? I got my wedding dresses and shoes- 2 dresses and 2 pairs of shoes for less than 300 dollars! I love my first dress, and will where it for the ceremony and part of the reception but to be honest, I am much more of a short and fun dress kind of girl. I found the first one for so cheap, I was able to get a second short one to party down in! :) And then, I completed ALL my centerpieces and they are perfect...just what I envisioned. And I did all of them for less 50 bucks by buying everything at the thrift and dollar stores and making them myself. Very exciting! Best of all though, Kevin and I are getting our first apartment this June. My Uncle owns it and is giving us a killer deal. It is not huge, but it covers all utilities and it has 2 bedrooms so I get a crafting room! Woo-hoo. 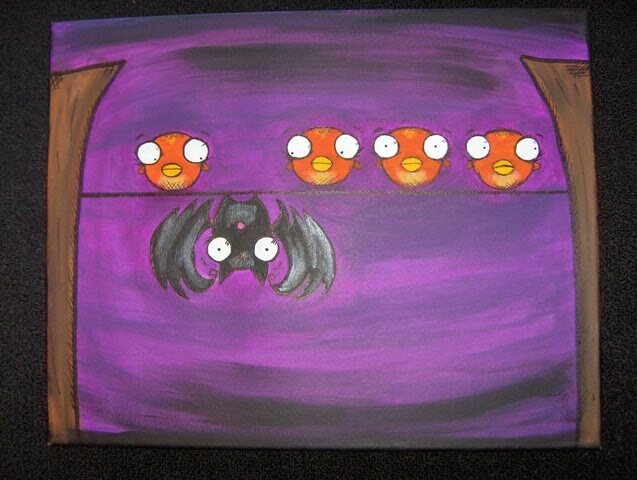 And since it is family, he is letting me paint it. AWESOME. I won't be moving in until after the wedding (we are old school kids) but you can bet I will be down there everyday painting and decorating it. So yes...it is a good week! Anyways, enough with my yabbering. I still have nothing new to show because I have been so busy/sick/etc. and I am saving all the wedding stuff for the big day. So I thought instead I would show you this painting. It is done in my favorite colors, (also the wedding colors) and it pretty much sums me up perfectly! I title it "Different Perspectives" which is fitting for my post too. :) Have a great week everybody! Not a lot going on here. Well, actually there is TONS going on, but nothing I can post still. It is either for swaps or the wedding and I am saving them all. Work is dragging lately. After this week though, only 3 weeks left! I have mixed feelings about it though, because as great as summer sounds, I am pretty heartbroken that I am not going back. Who knows though, a lot can happen in a few months! For now, enjoy these silly but cute monster plushies! I have sooooooooo many cute things to show you, I just need to get it all sent so they can be surprised when they see it. I am putting the final touches on Kira's and Audrey's packages (we all did a Facebook pay-it-forward pledges of making handmade goods for each other, and I am making their items tonight!!). So hopefully by the first of next week I will have something new. Long time, no talk. I have been sooooooooo incredibly busy lately. A lot of ups and downs in life lately too, so not a whole lot of crafting, and what I have done is TOP SECRET swap stuff. 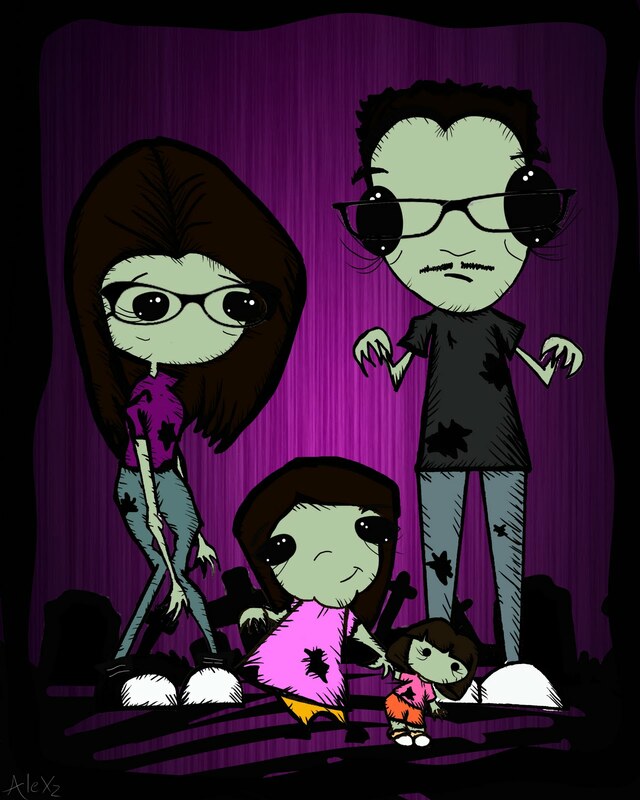 I did just finish this commissioned piece of a girl and her family...ZOMBIFIED! I hope she likes it! Anyways, I just wanted to pop in and say hello. Let you all know I AM alive- barely. It has been a long couple of weeks and I am pretty drained. These zombies have more vigor than I do right now. That said, it is off to bed for me! Good night and happy weekend everybody!